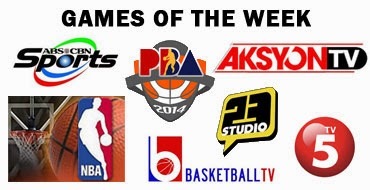 TV Schedule: Games of the Week (January 1-4, 2014) - Balita Boss! This January, during the first week of the 2014, here are the games on television. Broadcast live, via satellite or replay on Basketball TV, Fox Sports Philippines, ABS-CBN, Studio 23, TV5 and AksyonTV. TV: ABS-CBN / Replay on Studio 23 - 9:30 p.m.